It all started with Cindy Gaillard. The denizens of Opera Columbus asked Cindy, an award-winning WOSU TV producer, about ideas for an opera with a local setting. 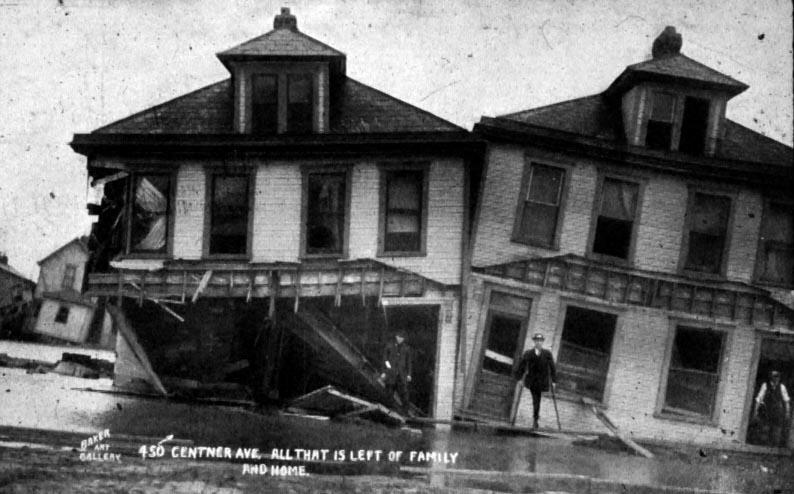 Cindy suggested the great flood of 1913, which devastated Franklinton in March of that year, leaving horrible destruction and nearly 100 deaths. Sounds perfect for an opera. The work was on. The result is The Flood, a one-act opera opening this weekend at the Southern Theatre. During All Sides Weekend Arts, Christopher Purdy discusses 'The Flood' with composer Korine Fujiwara, Opera Columbus artistic director Peggy Kriha Dye and Janet Chen, executive director of ProMusica Chamber Orchestra. Presented by Opera Columbus and ProMusica Chamber Orchestra, the world premiere features music by Korine Fujiwara, libretto by Stephen Wadsworth, sets by Charles Corcoran, costumes by Anita Yavich and light design by David Lander. Stephen Osgood conducts. I attended a dress rehearsal last night. The Flood brims with local references that will happily ground any audience member who is enticed to try opera for the first time. Broad Street, Poindexter Village, the Scioto Mile and Washington Gladden will ring true to older people who remember those entities in their primes, and to the young who are reclaiming neighborhoods and heroes. 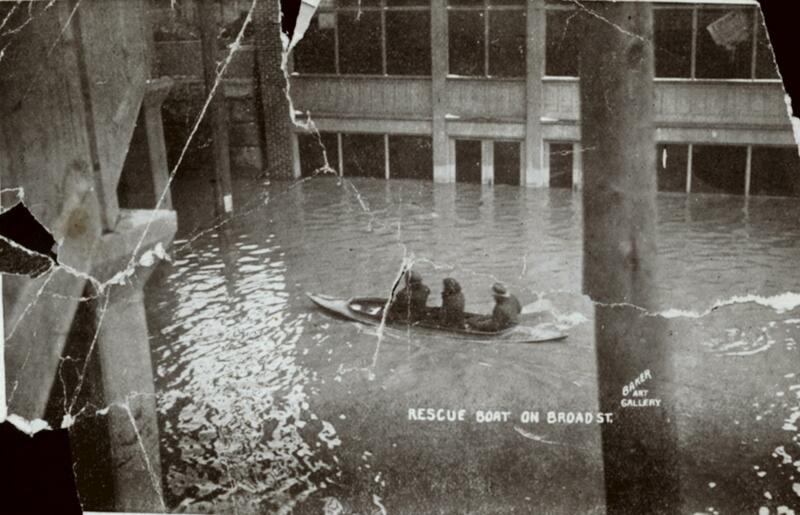 A rescue boat travels along Broad Street during the devastating flood of 1913. None of this would matter if Fuijwara and Wadsworth’s creation followed the pattern of too many new operas. I’ve seen wonderful performances and first-class production values, yet walked away not caring a thing for any of the characters nor remembering a note of music. There are always exceptions. David Little and Royce Vavrek’s JFK comes to mind. So does Breaking the Waves by Missy Mazzoli. Too often, we get a lot of language semi-sung and a busy orchestration that adds little. The Flood is filled with music. Fujiwara provides comforting orchestral support for the singers and musical motifs connecting the scenes. The solo opportunities and the fine ensemble singing are very impressive. Fujiwara beautifully meets the challenge of weaving together different emotions across generations that make sense musically while delighting the ear. I especially like the use of chimes and piano that help the audience focus as the action spans a century. Kudos to Osgood, who kept every ensemble together. I imagine conducting this opera would be as hard and as rewarding as leading Verdi's Falstaff. The stage presents four sections, four compact rooms. Characters are confined, usually, to the rooms marked 1913, 1940, 1970 and 2014. We are in the Hilltop or in greater Franklinton. 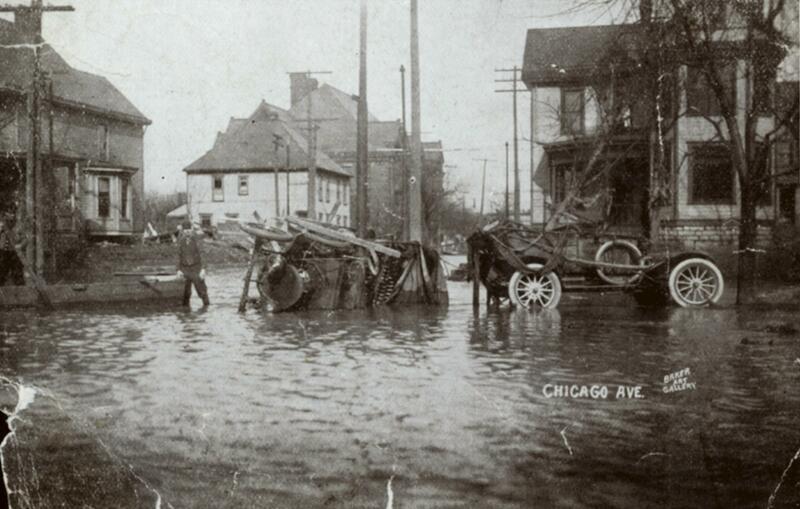 We see the immediate aftermath of the 1913 flood. We watch the effects spread over 100 years. There was a 10-minute period mid-opera during which I became confused as to how people and histories were tied together. Soon enough it became evident, and the result is very moving. So here’s the first indication of the success of The Flood. You care about every character. Everything about their situations rings true. Whatever the year, this could have happened to you, or to me. A young man sits at his wife’s deathbed after fishing her out of the flood, where she had been thrown against a brick levee. A German man – and he often signs in German very effectively – has a dueling chess game with his daughter. A young woman is about to be released from a mental asylum. Another young woman sits in her father’s kitchen, researching the history of this asylum and its “lost” patients. After an hour and 10 minutes, I thought, OK, Act I is over. Now there’s an intermission, and then we’ll have Act 2. Not so. The ending is unexpected and deeply emotional. Characters cross the stage, entering different rooms and different eras. You expect more, but you don't need more. That is how powerful this production, these words and this music are. The story is told, and you are left emotionally wrung out. When the character Frances moves from 1913 to 2014, you get a perfect catharsis. The show is filled with wonderful voices and one star. All of the singers were wonderful in this perfect ensemble opera. It’s always great to see Dan Stein and Rob Kerr on stage. I’m fond of both of them and admire their work. Stein sang well and impressed with his silences, his body language and his reactions. Kerr needs a big Verdi aria to do his voice justice, but he did very well in what he was asked to do. I loved Meroe Khalia Adeeb as Annie. Szymon Komasa brought a wonderful dark voice to Hans. He was especially impressive when reading a letter from his family repudiating him. The star is Amanda Bottoms as Frances. I hear a magnificent voice in this young woman. We’ll see if her luck holds out, but the lady has the chops. I’ve felt for a while that Opera Columbus is working too hard to reinvent the wheel. Their media sometimes seems to apologize for opera itself. Come anyway! We are re-imagining opera! We are bringing it up to date. 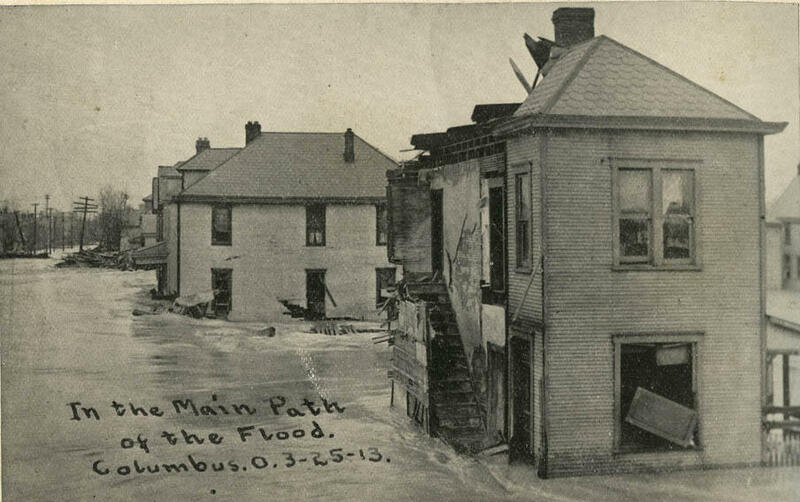 The Flood of 1913 hit Columbus on March 25, 1913. You know the drill. Like Verdi or Mozart need help. That said, the company has had more hits than misses. We’ve seen exciting productions of Carmen, Armide, The Turn of the Screw and Orphee. What Opera Columbus can do is foster new work, thus expanding the art form. A word about the audience. I’m talking to you. If you care about the arts in Columbus, you owe it to the community to attend a performance of The Flood. You owe it to yourself to meet Opera Columbus and experience this beautiful new opera. See you there. P.S. Let me know the next time you want to write an opera. I'll give you Cindy Gaillard's phone number. All Sides Weekend Arts: Opera Columbus "The Flood"
Join guest host Christopher Purdy for a discussion about arts in Columbus. Opera Columbus presents Benjamin Britten's operatic horror story The Turn of the Screw in the Southern Theatre, Wednesday, Sept. 27, Friday, Sept. 29 and Sunday, Oct. 1. Based on the novella of the same name by Henry James, The Turn of the Screw concerns a governess employed at a crumbling Victorian era mansion and the two children in her care. Miles and Flora appear to be charming, boisterous kids.